While Alfred Hitchcock wasn't really known for directing comedies, many of his films often contained an element of humor. This is especially true about his early British capers like The Lady Vanishes and The Man Who Knew Too Much, but perhaps most famous of all, in his 1935 espionage thriller, The 39 Steps. While the film isn't a comedy, Hitchcock often displayed a lighter touch in those earlier pictures before turning to darker and more macabre subject matter in his more well known later period. That makes something like The 39 Steps ripe for comedic adaptation, which is just what playwright Patrick Barlow did for his popular stage version of the film. Opening the 14th season at Triad Stage in Greensboro, NC, The 39 Steps is perhaps one of their most immensely likable productions yet. Featuring four actors, 150 characters, and lots of hilarity, The 39 Steps is a high energy farce that will keep audiences in stitches from beginning to end. The plot is much the same as in Hitchcock's original; an innocent man named Richard Hannay (Brian Lee Huynh) gets tangled up in an international espionage plot when he meets a beautiful and seductive secret agent (Laura Woodward) on the run. But when she turns up dead, Hannay finds himself wanted for murder, and sets out to complete her mission before top secret information about Britain's air defenses end up in foreign hands. His adventures will lead him to exotic Scotland, across speeding trains, in the lair of evil Nazis, and beyond, with countless characters deftly played by the immensely talented clowns - Sal Cacchiato and Andy Paterson. 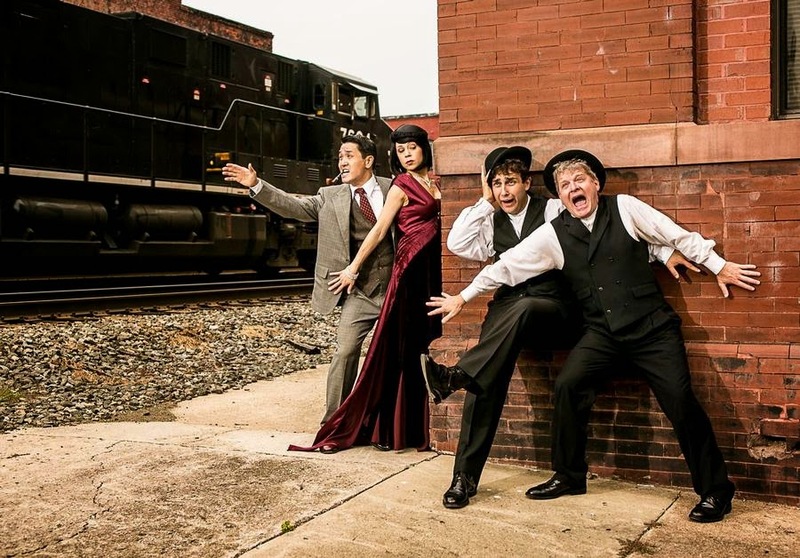 Brian Lee Huynh, Laura Woodward, Sal Cacchiato, and Andy Paterson in The 39 Steps. In fact, the on screen hi-jinks are so sidesplittingly funny one could almost miss the fantastic set design by Timothy R. Mackabee, which feels like a throwback to the grand theaters of old, with its elaborate chandelier and red velvet curtains. As soon as you walk into the theater you are thrust back into a world of femme fatales and dashing heroes with slicked back hair and tumblers of scotch. But even with all tongue-in-cheek suspension of disbelief and self-aware, meta-theatrical humor (not to mention the clever references to other Hitchcock films), director Jen Wineman makes us feel as if we are a part of a very specific, very heightened world, and makes sure that the audience is always in on the jokes. It's telling that Triad Stage has chosen to kick off their 14th season in such a high spirited and entertaining way - it sets a very fun and accessible tone for the season to come, which will certainly feature plenty of more serious fare. But The 39 Steps has something for everyone, and is the kind of show for which many people go to the theatre in the first place. Here's hoping this is a harbinger of things to come - a hugely enjoyable kickoff to another great season of theatre in the Triad. 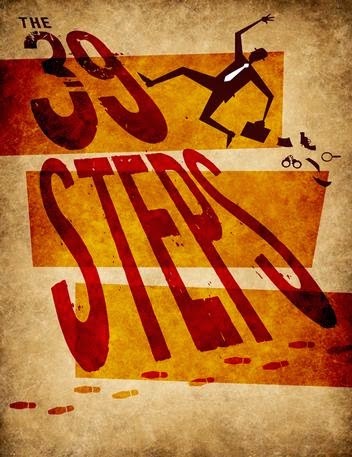 THE 39 STEPS runs from August 31 to September 28 at the Pyrle Theater in downtown Greensboro. For more information or to purchase tickets, visit www.triadstage.org.